Custom Rubber Keypads with In-Mold Graphics | Northpoint Technologies Inc.
In-mold decoration is used in custom keypads that are developed for use in a variety of products including medical and pharmaceutical products, telecommunications equipment, electronic devices, appliance panels, computer parts, point of purchase display components, and automotive parts. 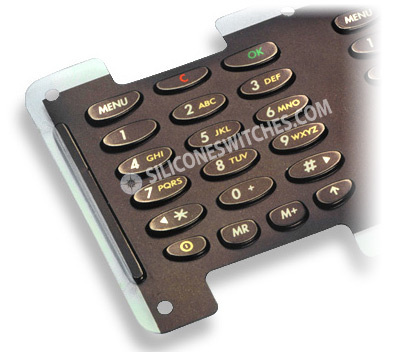 Custom keypads featuring insert mold decorations are popular because of their versatility. These custom keypads allow for printing complex graphics on irregular surfaces, are highly durable of decorative, and can be manufactured in numerous textures with a variety of finishing and forming capabilities. The in-mold graphics placed over silicone rubber keypads or mounted over metal domes can allow for producing different looking custom keypads from the same mold. Northpoint Technologies has expertise in the design and manufacture of custom keypads and silicone keypads that feature in-mold graphics.